We had wanted to get the shorter DH tensioner but the $124 price had held us off. 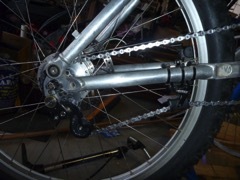 It had two advantages over the longer standard Chain Tensioner we had fitted. The arm was shorter and so less likely to hit rocks and obstacles and also it gave a better chain line though the C link chain guide we had recently fitted. One final advantage was the top jockey wheel runs so close (1mm) from the rear sprocket that it keeps the chain more secure. Fitting was interesting as it relies on the tension on the bolt through the “drop-out” to keep the tensioner in the correct place.